Design can support the design of health services, technologies and environments and is being used by hospitals and health services across the globe. Multiple studies illustrate that a focus on the design of hospitals as more person-friendly environments has a positive measurable impact on clinical outcomes and costs. A few years ago I was commissioned to design a mobile health app aiming to change health related behaviors for patients who have had a heart attack or who were at risk of developing cardiovascular disease. I visited patients in order to understand how they felt about their health, how they manage their condition, as well as their experiences of the health system and rehab. I found that people are often in denial about their health and don’t realize they are at risk. There is no clear association between lifestyle and prevention. Families are key influencers and supporters of behavior change. People need to first feel that change is possible and need to feel empowered to change their behavior. Through the research, I identified that at different stages of a patients journey with cardio-vascular disease, they may need to interact with an app in different ways. We created a framework to describe possible interactions with the tool over time, being awareness, education, empowerment, and behavior change. This framework allowed us to design for experience rather than just come up with a technology tool in isolation of its use and context. 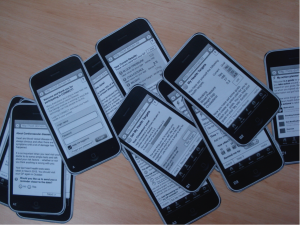 I next created some paper prototypes of the application and tested them with patients over a few weeks. We would make prototypes, test, refine and re-test. This iterative process ensured sure that the app would be understandable by patients once it was built. It’s much easier to modify prototypes than working code. Businesses are beginning to realize that design can support them to innovate. Design-driven companies have outperformed the S&P Index by 219% over 10 years. Companies that foster creativity enjoy 1.5 times greater market share. Executives are taking note and building design capability. 13 (10%) of the 2014 Fortune 125 companies have executive level or CEO support for design. Within my own work, I often use customer journey maps to support organizations to improve the services they deliver. Journey maps visually depict the interactions a customer has with an organization over time. Working with a telecommunications company I created a series of journey maps depicting the experiences of customers ordering and activating mobile products. Each map, depicting a customer’s experience ordering a specific product, showed the different things customers did across the different channels (e.g. see a TV add, research on-line, visit a shop etc. ), their frustrations (e.g. not being able to understand and compare plan inclusions), the tools (forms, brochures, sites etc.) they used and opportunities for improvement. To create these maps I ran workshops with staff and also interviewed customers. I found that the activities during the process that staff were unclear about seemed to correspond with the parts of the process that were most annoying for customers. These maps visually depict the current state from a customer’s perspective, provided a useful tool for the organization to collaborate with in order to improve the customer experience. Design can be used within business in so many ways! Jane Liedtka’s book Solving problems with design thinking shares 10 stories of what works. At the most basic level, human-centered design is about listening. To design interventions we need to go into communities to learn about the challenges people face and the realities of their lives. Last year I worked with an Australian government agency to understand how they could better support those working within as well as those affected by the child protection system. This meant understanding the needs of diverse stakeholders including kids in care, caseworkers, foster carers, birth parents, families, policy staff, non government organisations, police, magistrates, teachers, health professionals, etc. We used design approaches to understand the needs of the different stakeholders and came up with some opportunities for improvement. One of these interventions was a ‘digital suitcase’. Kids in foster care don’t have parents to look after their mementos, photos and documents for them. They can also move around a lot and rarely have photos of important people, school and medical records and other documents. The digital suitcase allows kids to have a safe space online to store their stuff. This repository helps kids, among other things, build a stronger sense of identity. There are plenty other examples from the Gates Foundation and IDEO.org, who are both very active within the design and social innovation space. As our problems as a global society become more complex, ways to co-create better futures is critical. In 2011 the European Commission launched the European Design Innovation Initiative (EDII) stating that: “by 2020, design is a fully acknowledged, well-known, well-recognized element of innovation policy across Europe”. Design is fueling innovation across the globe. Design also provides a powerful approach to public sector innovation. In Australia, Canada and the UK, design is being used extensively within the public sector. For example in Australia, the Australian Justice department are using design to look at how audio visual technologies can support the experiences of everyone involved in the justice system, including families, judges, members of the public, detainees, and police. Taking a human-centered approach, the design team is spending time at courts and correction facilities, conducting qualitative research with different service users to understand existing processes, their needs, frustrations and opportunities for the use of new audio-visual technologies within the justice system. As you can see there are so many different contexts for design.